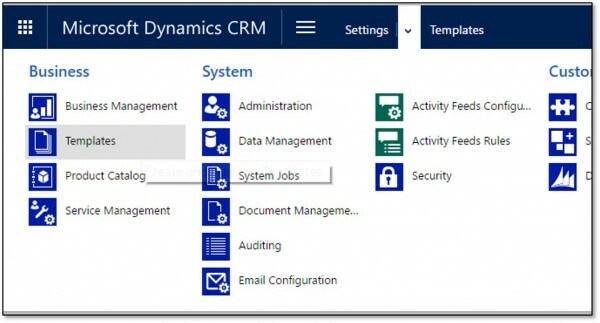 This blog is another in my series of Microsoft Dynamics CRM tips for sales professionals. We’ll look at a common sales scenario and how to manage it in CRM. You just met someone for the first time, or you’ve just hung up the phone. You want to send a quick follow up email with your contact information or additional information regarding the product or service this person has an interest in. 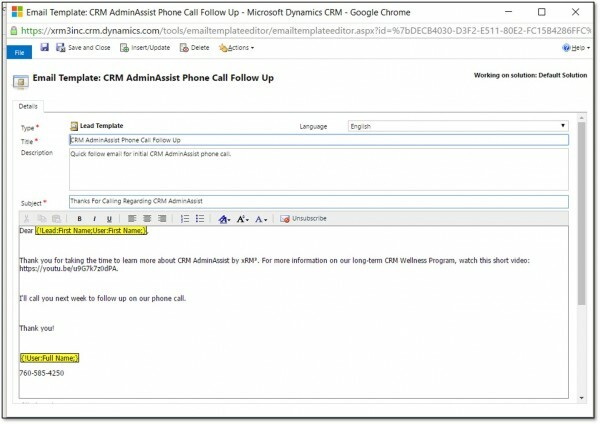 We’ll look at 2 quick follow up email strategies in Microsoft Dynamics CRM. First we’ll look a standard CRM Template you can send. Secondly, we’ll use a Quick Send Template from ClickDimensions. ClickDimensions is a great marketing automation tool that integrates fully with Microsoft Dynamics CRM. First let’s set up our follow up email using a standard CRM Template then we’ll look at how to use it. This isn’t terribly complex. I’d say an intermediate CRM user should be able to pull this off without too much trouble. Using the navigation bar, go to Settings, then click on your Templates icon. Choose the template type you need. In this case we’ll use the Lead type. Now we create the template. We’ll label the template so we can find it easily later on. Then we’ll add the Subject heading of our follow up email and the body. In this example the template is intended for new leads that have inquired about a service we offer called CRM AdminAssist. There are 3 things I’m accomplishing with the email. I’m thanking them for taking time to discuss my service, sending them additional information, in this case a link to a video describing the CRM AdminAssist service, and lastly my contact information. Pretty simple. Look at the areas in yellow. These are examples of personalization that create a better experience for my lead and allow other members of my organization to use the same template. This took just a few seconds to add. The first name of the Lead is going to automatically populate the salutation of the email. And at the bottom, my full name will appear above the company phone number. Now the template is set up and we’ll use it to send our follow up email. I open the lead record, in this case I’m using a lead record in my own name. 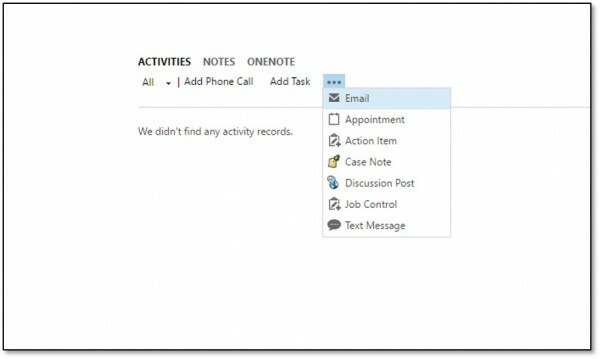 Click on the ellipse in the activities feed, and choose email. You can now choose which email template you want to use. 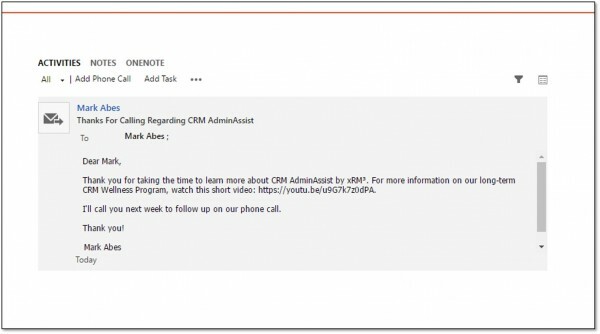 In our scenario we’re choosing CRM AdminAssist Phone Call Follow Up and click select. You can see it’s personalized the salutation, our video link is included, and contact information appears at the bottom. Click Send. 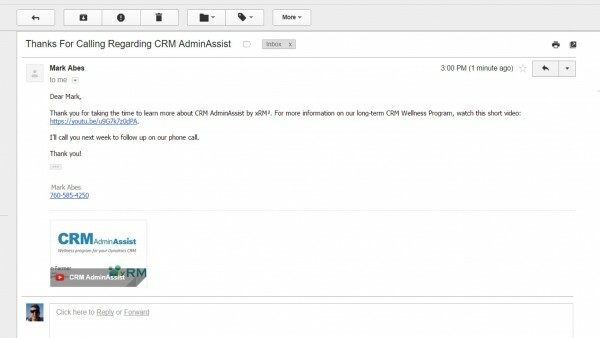 In order for CRM to send this email, it needs to be synced to your mail server. There are multiple ways to do that but we won’t get into that here. Now when we reopen our lead record, a copy of the outgoing email is visible under the activities feed. This is handy for future reference by you or other members of your team. Here’s what it looks like to the recipient. It’s a text based email with all the basic information we wanted to send included. But you may want something a little more attractive that provides us with more information to measure the interest level of this lead. With that in mind, let’s look at how you’d use the ClickDimensions Quick Send Template for the follow up email. You’ll need to be using ClickDimensions to do this next part. 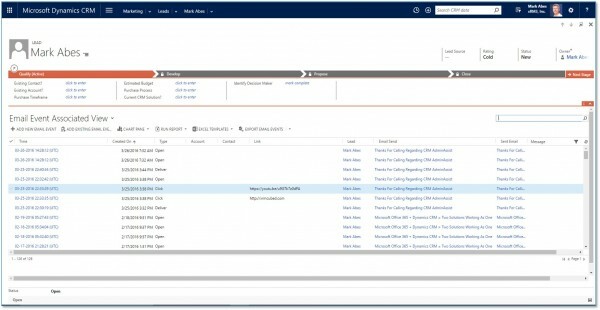 ClickDimensions is a robust marketing automation tool that is installed into your Dynamics CRM system, so it’s fully integrated and easy to use. Go to your navigation bar, under the Marketing tile, click on Email Templates. 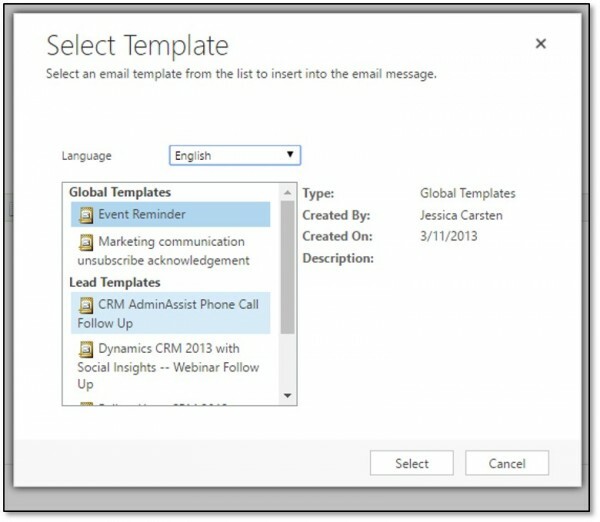 I create a new Quick Send Template with a message similar to that of the standard CRM template. I’m adding personalization to the template. The Lead’s first name will appear in the salutation. A hyperlink will point to the additional information I’m offering, and my contact information will appear in the signature. I’ve added a link to my company website here as well. 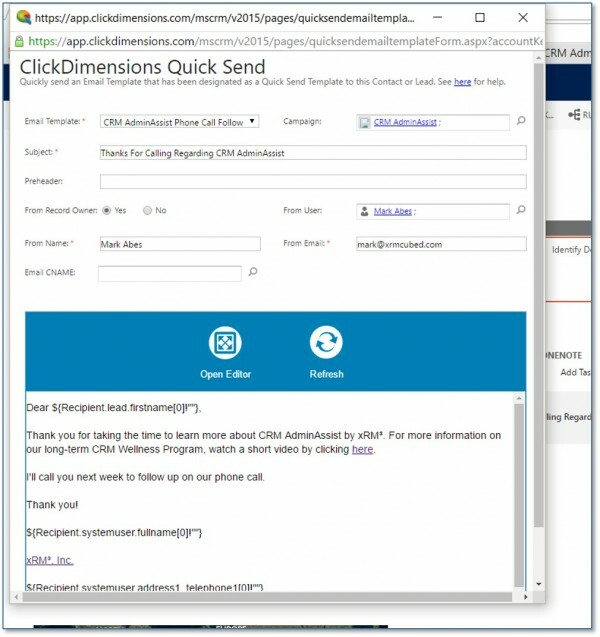 Now let’s use the ClickDimensions Quick Send Template for the follow up email. Click on the button at the top of the lead form. You’ll select which template you want to use. Fairly similar workflow to using the standard CRM template. I’ve assigned this template to a specific campaign so I can track sales activity generated by the campaign. This could be useful to your marketing department. I send the email. Now let’s look at the recipient sees. It’s a little cleaner than the CRM template, plus we have hyperlinks instead of URLs. There’s also a little more we get out of using this template that we’ll look at now. ClickDimensions is going to provide some important information about that outgoing email. Information you can use to gauge the level of interest or buying behaviors of this person. For instance, you may want to know if the person you sent it to opened it, how many times they opened it, did they click on any of the links in the email. All that information flows back to CRM through ClickDimensions. I open the lead record and click on the Email Events icon. I can see if the recipient opened the email. See when and how many times it was opened. See if they clicked on any of the links in the email. I can also ClickDimensions to see all the pages this lead viewed on our website. It’s a very powerful tool that adds some nice punch to a simple follow up task. That’s all it takes. If you’d like more information or help with Microsoft Dynamics CRM, or sales and productivity solutions at your place, feel free to email me (mark@xrmcubed.com) or give me a ring. By Mark Abes, Vice President of Sales and Marketing at xRM³, a Microsoft Partner focusing on sales and productivity solutions powered by Microsoft Cloud. Based in San Diego County Southern California. For help, contact us by clicking here.